There are several ways to approach managing mods--and we each gravitate to the one that works best for us, hopefully. I have a folder called "Downloaded Mods" where I keep a copy of every version of every mod I have ever downloaded (call me a mod hoarder!) each in its own folder, because updated mod .pkm files often have the same name as older versions. Then, between games I copy the ones I want to use to windata and erase the ModEnabled_ and ModIndex_ keys from my Banished registry. This latter habit got started in the early days of modding when things were not always stable. I don't recommend it to those who are uncomfortable mucking around in the registry, and I always remind myself how little I know so I don't go doing dangerous stuff. I like the idea of the Mod Manager, but old habits die hard. You can add your own description to individual mods. Double-clicking the item opens the editing window. The description is displayed when the mouse pointer moves over the item. You can turn it off by unchecking Show mod description. Descriptions are stored in ModDesc.ini. I could not find out how to get descriptions from pkm files. The description in the picture was obtained by copying the text from the downloading thread. Mod is a word taken from English into Czech. MOD is not translated from Czech into English as MODE. And the word "mod" has nothing to do with the word "móda" (="fashion"). The word "mod" in Czech is related to the word "modifikace" (="modification") . Remember it at last, Google. Thanks to all you guys searching ways to improve the gaming experience! Just installed and used for the first time. Awesome work! Really handy thanks so much. @JM I have version 0.5 but there is no scroll bar so some of my mods don't show on the available space. I have a LOT of mods installed. That's strange. The program only uses standard components. If not all items fit into the window, the scrollbar should appear automatically. Can you insert a screenshot here? 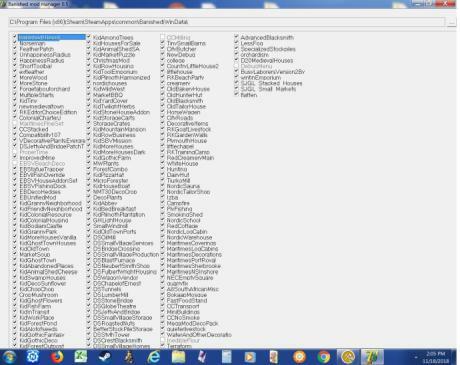 @JM below is the screen shot of Modman 0.5 on my computer at full size, taking up my entire screen. The right menu does not show at all, no scrollbar at the bottom, and no way for me to make the screen larger to see all the mods. I tried version 05 on a Windows 10 computer. With default font size 100% works well, with 125% looking as distorted as on your screenshot. Maybe that's the cause. The 05x is testing version. It works on my computer even with scaling other than 100%. Please try it, and if it works then I will find a clean solution. I used dirty trick in this quick fix. The program is written in old Delphi7 and scaling causes trouble. Use new 'F' button to change the mod-list font, if there were so many mods that they do not fit on the screen. Modman5x works fine! No cut off, all as it should be, with scroll bar. Thanks! You spoke of scaling. I don't see so well so I used the display option in my computer to find a good display for me. So it did make changes to my computer. I guess it was to scaling. yes! this is much needed, thank you!